We know you’re busy, so we’ve developed 31 days of Pediatric Stroke Awareness Month ideas for your Facebook status. Cut and paste these into your status each day. Add chasa.org to any posts that don’t have other links so people can find more information. Ask your friends to share your posts. If a child under the age of 18 months seems to be a lefty or righty, check in with your state’s early intervention program or a pediatric neurologist. Early hand preference may mean an early stroke. Between one in 1600 and one in 2800 babies will have a stroke before they’re 30 days old. Why don’t we have an exact number? More research is needed to determine how often strokes occur in this perinatal period. My daughter is a pediatric stroke survivor and this does not define her. She loves [fill in hobbies and interests – reading books, swimming and going to movies]. Pediatric Stroke Fact: Delay in diagnosis or misdiagnosis of stroke in children is still common. Suggestions for pediatricians during Pediatric Stroke Awareness Month. Provide a medical home for children with disabilities that emphasizes the family as a valued partner in decision-making, coordinates care with sub-specialists, and links families with community-based services. Remember to recognize the siblings and special friends of your child who has a disability. Share photos and celebrate! Suggestions for pediatricians during Pediatric Stroke Awareness Month. Recognize the unique needs of parents and siblings of children with disabilities, and offer strategies for them to promote their own physical and emotional health and well-being, including links to family support groups and mental health services. During Pediatric Stroke Awareness Month, we honor the two women who started it all in 1996 – Nancy Atwood and Joni Stasiak, founders of CHASA, the Children’s Hemiplegia and Stroke Association. These two moms found each other online back in the day of dial up internet access. Nancy learned to code websites by hand, using a book from the library and Joni had the vision to host the first CHASA Retreat. Where would we be without them? During Pediatric Stroke Awareness Month, we honor the children of the CHASA Founders. During Pediatric Stroke Awareness Month, we honor the researchers who are dedicated to finding ways to make life better for our children. During Pediatric Stroke Awareness Month, we honor the moms and dads who pull themselves through heartache and joy each minute of the year. During Pediatric Stroke Awareness Month, we honor Nancy Atwood and Heidi Jameson – two moms who were tired of hearing “I didn’t know a baby could have a stroke” and decided to create the first Pediatric Stroke Awareness Day in 2002. 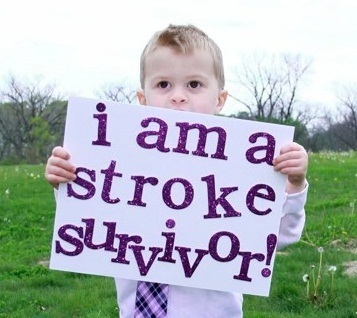 Thank you for helping us educate the community about pediatric stroke and related disabilities. Thank you for raising funds for CHASA so we can continue our mission of improving the lives of children and adults living with a diagnosis of hemiplegia due to stroke and other causes. And most of all, thank you for helping us reach so many families with our message that they do not need to travel this journey alone.